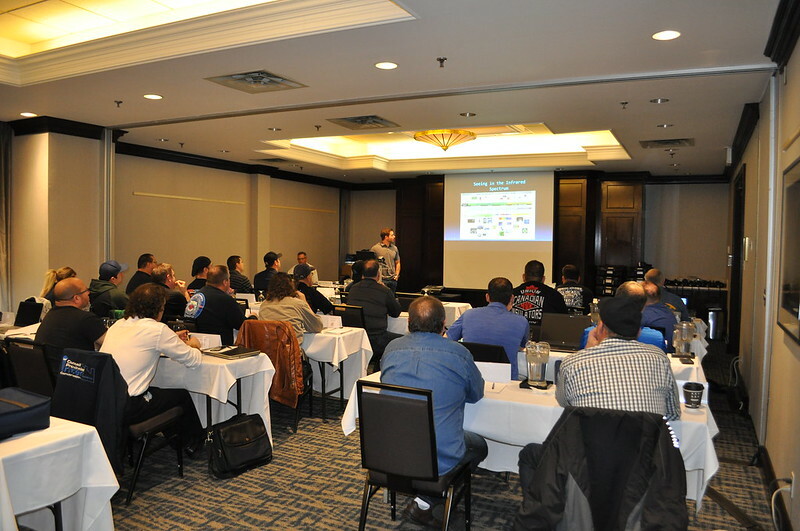 HFIAW Local 135 Training Instructors John Yunker and Daniel Haguewood led the Thermography classes in Toronto on Dec. 4 and 5. The same instructors also led a combined Green Awareness and Thermal Imaging class from Jan. 29 through Feb. 1 in Baltimore. Brothers Yunker and Haguewood taught the Thermal Imaging course, while the Urban Green Council provided instruction for the Green Awareness class. Robert Reap, International Vice President of the New York New England States Conference, attended the Baltimore training classes. He believes more promotional work needs to be done to make people aware of how union Insulators provide green energy services that help the environment. “We need to continue to promote the discussion and awareness of what Green Energy means for the environment, and more importantly, for our industry and how we can fill that need,” said Reap. Reap also stressed the importance of making Business Managers and Organizers aware of the basics of thermal imaging and green awareness. “I need to get this training and turn the information around,” he said. “If I can get the basics of thermal imaging and green awareness out to the Business Managers and Organizers in the New York New England States Conference, they can pick it up. International Vice President Leo Damaris, from the Southwest States Conference, also attended the class and thought the instructors did an excellent job. He stressed the importance of members obtaining the proper certification to perform energy audits. “It is important that when we put ourselves at the Green/LEED table, that we can push mechanical insulation to be added to completed buildings,” said Damaris. The former Business Manager of Local 53, Damaris said his Local performed an energy audit on the Mercedes-Benz Superdome, and as a result, two members of the Local now work at the facility, full-time, to maintain the insulation systems. “Thermography is a tool that can be used to access potential customers,” he said. Damaris will lead a Green Energy Committee at the upcoming Local Union Officers Meeting in May and plans to take more training classes in the future. “I want to position the Business Mangers and leaders in all of our Local Unions to be educated on topics that pertain to our industry and could put our members to work,” Damaris said. The IIIATF would like to thank HFIAW Brothers and Sisters who participated in the December class held in Toronto: Richard Chartrand and Pierre Gollain from Local 58 Montreal; John Casey, Bryan Ross and Mark Seguin from Local 95 Toronto; Terry Garton and Paul Horishney from Local 99 Winnipeg; Dan Annett, Stacy Edmondson, Brandon Hammond and Kevin Lecht from Local 110 Edmonton; Matthew Benson and Alyre Malley from Local 116 Halifax; Ashley Duncan and Riley Feser-Gray from Local 118 Vancouver; Roderick Alberton, Carey Chutskoff, Lawney Larter and Brad Vandale from Local 119 Regina; James Roy and Josh Sherrard from Local 131 Saint John; Robert Hunt and Paul Stone from Local 137 St. Johns; Meg Rexroat from iSave and Regional Organizers from the Canadian Conference Jamie Andre and Jamie Bergeron. The IIIATF would like to thank the following members who participated in the January class held in Baltimore: Daniel Ruiz from Local 5 Los Angeles; Pete Deimler from Local 23 Harrisburg; Cody Pugh from Local 24 Baltimore/Washington DC; Paul Davis from Local 41 Fort Wayne; JJ Walker from Local 46 Knoxville; Sean Duggins from Local 76 Albuquerque; and International Vice Presidents Leo Damaris from the Southwest States Conference and Robert Reap from the New York-New England States Conference.